Richard Cox is the grandson of Catharine E.B. 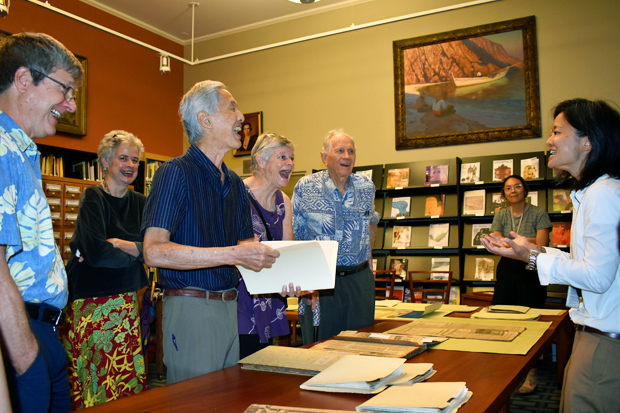 Cox, who not only helped museum founder Anna Rice Cooke open the Honolulu Academy of Arts (now Honolulu Museum of Art) but was also its first director. Mr. Cox and his brothers have continued their grandmother’s legacy, endowing the biannual Catharine E.B. Cox Award and regularly making gifts to the museum. To thank Mr. Cox—who is 99—and his family for their generosity, on April 20 we invited them to an event in the Richard Allerton Library. 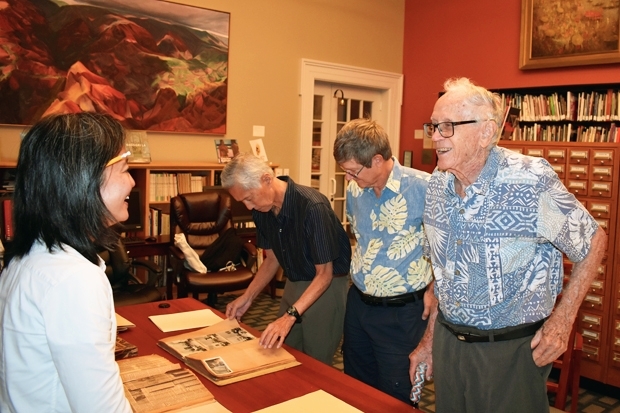 That’s where archivist Dawn Sueoka assembled a selection of archive finds illustrating the Coxes’ long contributions to the development of the museum, from newspaper clippings about the museum’s opening day on April 8, 1927, to original blueprints of the property. Richard Cox with his granddaughter Pia and great granddaughter Catharine, on her first museum visit. 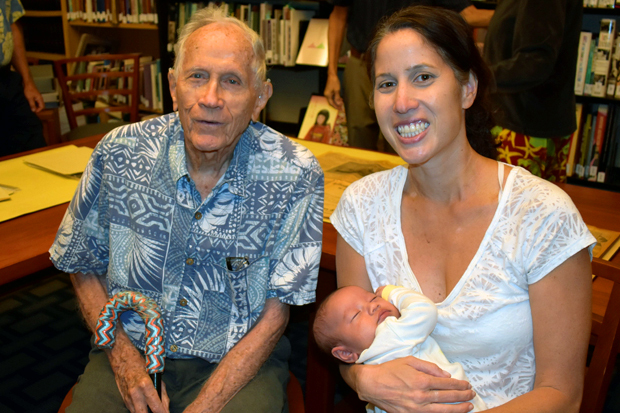 Mr. Cox arrived with four generations of family—including his six-week-old great granddaughter Catharine on her first visit to the museum. A family member mentioned that when Catharine E.B. Cox attended her Bryn Mawr College reunion at the age of 80, she did a handstand for her classmates. In an “aha” moment, Sueoka pointed out a news clipping that confirmed the story and everyone burst into laughter. Archivist Dawn Sueoka, right, swaps stories of Catharine E.B. Cox and Kaua‘i with the Cox family. On a side note, Sueoka is from Kaua‘i, where her family owns the famed Sueoka and where the Coxes also lived when Richard Cox’s father worked for Alexander & Baldwin. The Cox’s recalled buying many sandwiches from the Sueoka Store over the years.